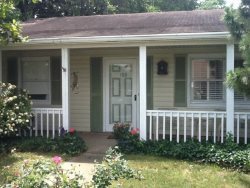 North End Virginia Beach, VA Vacation Weekly Summer Rental Home, Beautiful home steps to the beach. Oceanside of Atlantic Avenue. This fully furnished 4 bedroom, 3 bath summer rental has a gas fireplace, 2 decks for outdoor entertaining, dining room, sunroom and ample parking. Hardwood floors throughout, there is a bedroom on the first floor with a full bath. Off of the sunroom, the large deck overlooks the private backyard. Upstairs are three additional bedrooms with 2 full baths and a rooftop deck. Located close to the end of the Boardwalk, you can hop on a bike and cruise down to the Virginia Beach Fishing Pier or Rudee Inlet, enjoying the many restaurants along the way. This is a Friday to Friday rental.